When I saw the subject line of the e-mail, I was intrigued. “Watch local chefs sow seeds of food, nutrition knowledge with SC kids.” I read further. 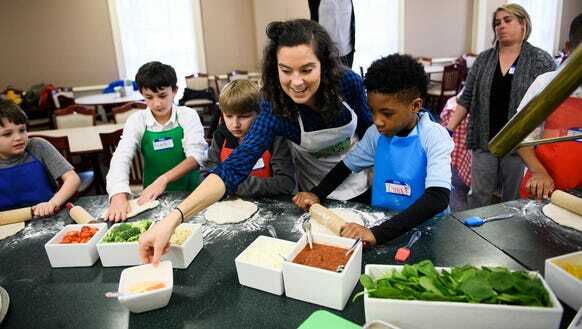 Bon Appetit Management Company, which handles the food service at Furman University was bringing its healthy kids in the kitchen program to Greenville to teach, cook and eat with local kids. Hmmm, could be an interesting story, I thought, but really, my motives in responding were a bit more self-serving. Needless to say, I’m always looking for guidance when it comes to feeding my kiddos healthy meals and also introducing them to veggies (they are avid fruit lovers) and just new foods in general. So, I responded. I was put in touch with Hannah Schmunk, manager of food education for children for Bon Appetit, and creator of the program. Bon Appetit handles the food service for hundreds of universities and companies throughout the U.S., including Furman University and Milliken here in the Upstate, and last year launched the “Healthy Kids in the Bon Appetit Kitchen” to take the lessons of healthy eating, cooking and where our food comes from to the younger set. Schmunk, it turns out, is an Upstate native — she grew up in Spartanburg but now calls San Francisco home — and she is also an expert on getting kids to eat healthy. She invited me to witness. I arrived at the Daniel Dining Hall at Furman to the program already in progress. The table of about 16 students from the Boys and Girls Club were learning about plants, and about which parts we eat. Two students stood in front essentially becoming plants, thanks to Schmunk’s life size costume. Next up, was talking about favorite fruits and vegetables. Surprisingly, no one said they didn’t like fruit and veggies, and the mention of broccoli actually brought cheers. Many times, we don’t give kids enough credit or opportunities to try and like healthy food, Schmunk said. The star fruit went over great, while the pomegranate seeds were a little more of a hard sell. “Like seeds that got stuck in someone’s blood,” one child said quite accurately. He understandably declined a taste. Next was actual cooking. On the menu was garden pizzas. So, each child got their own ball of fresh pizza dough to roll out and top as they wished. There was a rainbow of toppings but nary a slice of pepperoni in sight. Instead, there was broccoli, fresh spinach, cherry tomatoes, Portobello mushrooms and fresh basil. 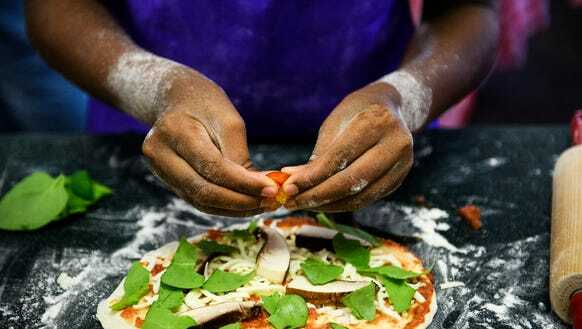 I hung with Shaundia Stokley and Jaryn Gerald, best buds who were surprisingly good pizza makers. The two chatted on about what they might do and settled on spinach for sure, tomatoes and mushrooms. Both kids also said they’d love to make pizzas at home. ♦ Make healthy fun. Encourage trying new foods in a positive way. Frame it as an adventure and something exciting. ♦ Use positive food language. Don’t offer healthy foods in a negative way, i.e. “if you eat your broccoli you can have dessert,” or “if you finish your salad you can watch your TV show.” This sets vegetables up for failure. Instead, use exciting and fun language – you don’t HAVE to try something, you GET to try it. ♦ Know that kids have this innate food neophobia. So try to build confidence, curiosity and appetite for adventure as a way to build excitement for new foods. ♦ Give kids a chance to participate in cooking. Let them be the sous chef in your kitchen in the evening. Give them jobs, let them taste test the ingredients as you’re preparing a recipe so they can see how it transforms into a finished dish. It can be as simple as adding a pinch of salt, or tearing lettuce leaves, just include them. ♦ Talk about it when you taste it. Is it sweet or crunchy, is it tangy, so that it’s kind of this fun exploration. 1. Chop tomatoes, bell peppers, and onions. If you have a kid-safe knife, enlist your child to chop the tomatoes and bell peppers. Ask your child to measure 2 cups of chopped tomatoes, 1 cup of chopped bell peppers, and 1/2 cup of chopped onions and pour into a large mixing bowl. 2. Ask your child to pull the cilantro leaves off the stem and tear them into small pieces. Add the torn cilantro leaves to the mixing bowl. 3. Slice 2 limes in half and ask your child to squeeze the juice into the mixing bowl. 4. Ask your child to add 3 pinches of salt to the bowl and mix all the colorful ingredients together. Voila! You have Garden Salsa! 5. Prepare your favorite taco toppings and enlist your child’s help wherever possible – draining the black beans, peeling the carrots, scooping the avocado, etc. 6. Assemble taco toppings on whole wheat tortillas just the way you like it, top with your freshly-made garden salsa, and enjoy!